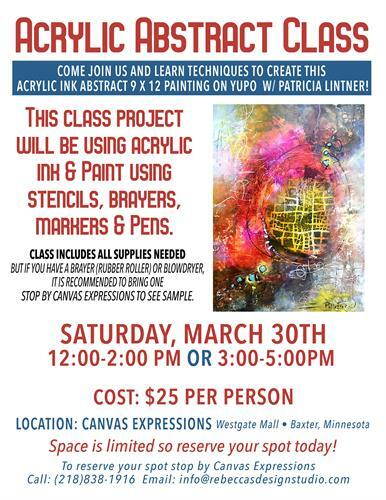 March 30th 12pm-2pm OR 3pm-5pm..
Come join us and learn techniques to create this Acrylic ink Abstract 9 x 12 painting on yupo with Patricia Lintner! The Class Project will be using acrylic ink & paint using stencils, brayers, markers & pens. (If you have a brayer (rubber roller) or blowdryer, it is reccommended to bring one. You may stop by Canvas Expressions to see example).